When Abraham Lincoln uttered the words “our White men are cutting one another’s throats” to a deputation of Blacks at the seat of government in Washington D.C. in 1862, not even he could have foreseen the slaughter that would take place over the next three years in his country: more Americans were to die in that Civil War than what were ever to be killed in any war before or ever since. Once the Union had been established, it faced two critical issues: whether the United States of America should be a federation or a confederation; and whether the institution of indentured labor—in effect a lighter form of slavery—should be allowed to continue or not. Together these two issues led to the American Civil War, which can be counted as one of the great turning points in American history: it set the new nation against itself, the South, supporting confederalism and indentured labor; against the North, who favored federalism and the abolition of slavery. Great White armies fought each other and finally decimated the South, all in an argument over the future of the Black race. Before the Civil War, Blacks were not allowed to join state militias or the U.S. Army or Navy, and the federal government refused to give passports to free Blacks. This status had been confirmed by the US Supreme Court in the Dred Scott case of 1857, when it had ruled that Blacks could never be citizens of the United States. When the Civil War started, the Northern government initially refused to allow Blacks to be enlisted into the army. By 1862, the rules had been changed slightly: Blacks were allowed to enlist in segregated units, led by White officers. By the end of the war, more than 200,000 Blacks had served in the Northern Army and Navy. The North and the South had differing aims in the war, which were to determine their strategies: the South only wanted to maintain its independence; while the North wanted to suppress the secession. This meant that the North would have to invade the South: this led to the North being the offensive power in the war, with the South being the defensive power. Lincoln indeed had suspended many of the tenements of democracy: critics of the war were arrested and detained without trial for long periods. The most famous example was an anti-war congressmen from Ohio, Clement L. Vallandigham, who was arrested in May 1863 after making an anti-war speech. A military court sentenced him to prison, but Lincoln changed the penalty to banishment to the Confederacy. 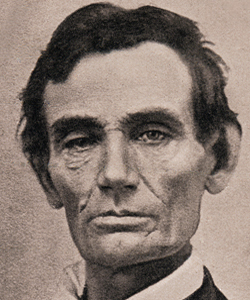 Then on 1 June 1863, Lincoln suspended the principle of freedom of speech—a right guaranteed by the first amendment to the Constitution—by banning publication of the Chicago Times, which had become increasingly anti-Lincoln. An uproar followed, and Lincoln was forced to back down on the issue. The march north—led again by general William Tecumseh Sherman—again left a deliberate wake of destruction in its path. Once supplies had been seized, it was the norm for houses and farms to be destroyed, and then the White population to be left to the mercies of the freed Black slaves. As a result of this scorched earth policy, Sherman’s name came to be hated in the South, and with good reason. Fifteen towns were burned in whole or in part, but no act of destruction compared with or caused more controversy than the burning of Columbia, the state capital of South Carolina, which saw the city utterly destroyed for no military purpose at all. On 17 April, the last Confederate forces surrendered in Durham Station, North Carolina, with the last two sizeable Confederate armies, one in Louisiana and the other in Texas, both surrendering in May 1865, realizing that the war was lost and that it was pointless to fight on. Finally the president of the Confederation, Jefferson Davis, was taken prisoner in Georgia on 10 May. The war was over. The US Congress, now totally dominated by anti-slavery activists who wanted revenge on the South for not only the practice of slavery but also for seceding from the Union, passed a series of laws designed to bring the South firmly under control. Then the Constitution of the Union was amended (the third section of the 14th Amendment, ratified on 9 July 1868) through which massive numbers of Southern Whites were disenfranchised because they had rebelled against the Union. At the same time full voting rights were extended to all the now emancipated slaves; the classification of Blacks as “three fifths of a person” clause in the Constitution was revoked by this amendment (although the Amerinds were still specifically excluded from the franchise). The resulting administrations in the South provoked great resentment, and stoked the fires of racial conflict. Large numbers of Whites were barred from voting, and the legislatures of the Southern states were in many cases dominated by illiterate Black former slaves who suddenly found themselves propelled from picking cotton into running the affairs of state. They were of course incapable of running the government efficiently, and the organs of government began to deteriorate almost immediately, with orderly government breaking down in many areas. Former Black slaves were also placed in many areas as soldiers and officers enforcing law and order over the defeated Southern Whites. This provided plenty of opportunities for revenge and abuse. In addition to the appointment of hopelessly incompetent Blacks to fill the positions of government, unscrupulous Northerners also took up positions in the Southern government, often merely to embezzle funds and enrich themselves: they became known as carpetbaggers. Northern civil war veterans were put on the official state payroll; Southern veterans were consistently denied any form of pension. Finally in 1871, the American president of the time, Ulysses S. Grant, largely in reaction to Southern White complaints that they were disenfranchised while illiterate Blacks were granted the vote, assented to a further change to the U.S. Constitution guaranteeing the rights of all citizens. By 1871, with Whites having been given back the vote, they once again formed the majority of voters in the South. The Southern Democratic legislatures then enacted a series of segregation laws designed to separate the races in all aspects, from schools through to public places. Many of these measures were in due course to spread to the north of the country a well. In 1875, the US Congress passed a Civil Rights Act of 1875, which barred discrimination by hotels, theatres, and railways. In 1883, this act was declared unconstitutional on the grounds that it interfered with the right of control-of-access to private property. Racial consequences of the war. The after effects of the war on America’s White population was vast. At least 250,000 Confederate White soldiers were killed—five per cent of the South’s White population. Vast areas of farmland were devastated, and many great cities, like Atlanta, were virtually leveled to the ground. The South’s four million Blacks took advantage of the chaos to seize as much property as was remaining, with their claims often being legitimized by the Black dominated Reconstruction governments. The Civil War severely dented the White population in America: a total of 610,000 Whites were killed—compared to the 4,435 who died during the War of Independence. These figures included 360,000 on the Northern side and 250,000 on the Southern side. Although the North lost more men, that region had a greater White population of some 22 million. The South, however, had a population of only some 8 million whites. In percentage terms then, the war was far more devastating to the South than to the North. That’s why National Socialism is primarily a way to ‘clean house’ with our own race first and foremost. In other words NS is directed against the primary enemy, the white traitor, the real ‘enemy within’. – This statement is inaccurate to say the least, and just a little research would have revealed it to the author of this article. Number of Americans killed in WW2: 291,557 ,number of Americans killed in the Civil War : 214,938. Total military deaths, not the number killed in action. Civil war = 650,000 dead, WW2 = 400,000 dead. What I don’t see mentioned is the formation of the KKK (and other similar organizations) during the reconstruction period whose primary purpose was to protect Whites from Blacks. Since these units were made up of ex-soldiers they weren’t some kind of rabble as commonly depicted. If I recall correctly, the treatment of the Southerners was so atrocious, that some of the ex-army units reformed and gave battle to Union forces, which helped get the Southerner’s rights restored. Also, if I recall correctly, a great many of the carpetbaggers were Jews, which is one of the reasons many Southerners still hate them. There is also a little talked about fact that a very large portion of the Northern forces were made up of recent immigrants, who sometimes protested being drafted and there were several riots in the North due to this. Apparently, they couldn’t get enough ‘real’ Americans to sign up to kill their own kin. Kemp does mention KKK in the above chapter. These are only excerpts.